The Model 428-PROG Programmable Current Amplifier converts fast, small currents to a voltage, which can be easily digitized or displayed by an oscilloscope, waveform analyzer, or data acquisition system. 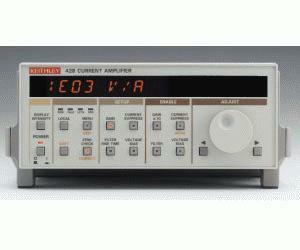 It uses a sophisticated "feedback current" circuit to achieve both fast rise times and sub-picoamp noise. The gain of the Model 428-PROG is adjustable in decade increments from 103V/A to 1011V/A, with selectable rise times from 2µs to 300ms.